The match today began with a dreary start; everyone had expected the match to be postponed due to the on and off rain showers. The athletic director, Ms. Lippy, unfortunately declared that the match could not be postponed since leagues begin on Monday. Reluctantly, the girls wrapped up in their rain gear to play their last tennis match. All the senior players being recognized before the match for senior night, many of the parents walked around the courts in the rain picking up leaves for the impending matches. After a bizarre night with faulty scoreboards and a fire alarm going off, the Lady Pioneers volleyball team took down Ephrata 3-0 in volleyball. Entering the match, Ephrata had a 4-2 record overall, and a 2-2 record in the season. The Pioneers went into the match with a 5-2 record overall, and a 2-2 record in their league. A 3-0 win usually means that it was a one-sided performance, but this was not the case. Neither team was able to make a substantial lead. The girls in blue were able to score the vital points that took them to the win. Ephrata was able to stay in the fight, but kills from Leah Wieland, Katelyn Reed, and others did enough to stop any potential streaks from the Mountaineers. With rain pouring down -- and doing its best to damper senior night proceedings -- two teams took the field under the lights to play soccer, unsure of how the game would turn out. 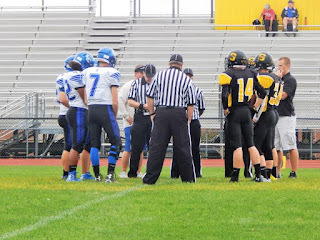 L-S played Solanco in an exciting and invigorating game on Pioneer Field September 29. 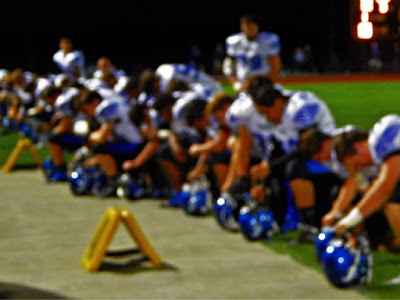 The game began with palpable tension felt both on the field and off of the field due to recent events at Friday night’s football game. The game commenced with strong efforts from both teams. L-S began the half with two quick shots, one from Matt O’Neil at the 8 minute mark and one from Alex Knarr at the 10 minute mark. L-S and Solanco fought for the ball, but L-S triumphed, with the first goal scored by Alex Knarr off of a corner kick from Jordan Bishop in the first 12 minutes. 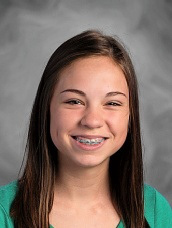 For the third consecutive year, Mackenzie Miller is headed to county chorus. A successful audition this Saturday marks the first step in what she hopes will be another journey that since her sophomore year has led her to District and Regional Chorus, and last year advanced to State Chorus as well. For now, though, she is happy to have made the county ensemble. "The county chorus experience is one that I would do again in a heartbeat," she says. "It gives you such an accomplished feeling when you practice and practice the music. You know every eighth rest and syncopated rhythm and then can share that love for music with others." Starting Wednesday, September 30, the Lampeter-Strasburg Information Technology department will begin moving student email accounts from the district email server to Google’s. 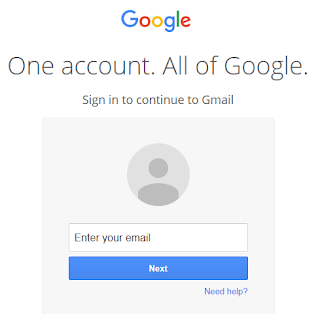 Even though the email accounts will still end in l-spioneers.org, the accounts will be Gmail accounts. The migration may take several days. All student email will be preserved during the migration. Students can access the new student email by simply logging into http://www.gmail.com with their L-S login information. Students will know when the move is complete because they will no longer be able to log in at the old address (mail.l-spioneers.org/owa). With this change, students will have the ability to send outside the district and receive email from outside the district. Anyone with questions may contact Mr. Griscom, L-S Director of Technology. Well this escalated quickly. From a rivalry game to some chippiness to a player leaving the field in an ambulance to angry social media rants from both sides, over the past week, what began as a friendly rivalry has been transformed into a divisive, vitriolic, proving ground for who can utter the most demeaning statements about the other side. And that’s not good. Backyard brawls should be fun, not real brawls -- whether physical or verbal. And when fun metamorphoses into spite, it is time we all take a step back and regain some perspective. As one who attends school at L-S and attends church in Solanco (spending a large chunk of my life on 272 driving back and forth), I spend a significant portion of my time in both communities. Let me say this: L-S: Solanco is not simply a group of vicious warlords out to get anyone in their path. Solanco: L-S is not simply a bunch of whining crybabies. As the Girls’ Tennis Team nears the end of the season, the last two matches are key to securing their spot as the number two team in the league line-up. The game began with the threat of impending rain, further postponing matches into the weekdays, which all have a chance of rain. Anxious about the impending rain, the team began their second to last match. The girls’ attention was high, knowing a win must occur in order to maintain their spot in the league. While scanning the dark, grey skies, the girls began their doubles matches with high expectations. 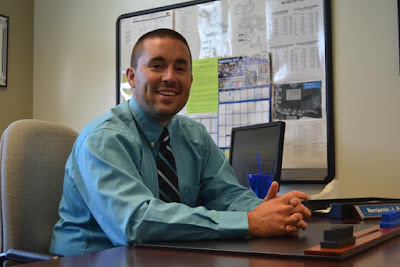 After successfully defending his dissertation on September 22, Lampeter-Strasburg High School assistant principal Benjamin Feeney was proclaimed a doctor. “I would say that it is still pretty surreal to me when people are coming up to me and saying, ‘Congratulations, Dr. Feeney’ or ‘Hey, Dr. Feeney.’ It’s definitely taken a little getting used to,” the new doctor says. Feeney seems at ease and very excited to be talking about his accomplishment, especially since it is for L-S News. Dr. Feeney remarks about how he loves to read the articles and get a student’s perspective. He wants to get to know the student body, and this is a great way to reach out to them. Being friendly with the students holds great importance to Dr. Feeney. He taught social studies for seven years at Conestoga Valley, so he is used to interacting with teenagers in a kind, yet authoritative way. LS News is excited to announce that our content is now a channel on the new Apple News app available to all iOS 9 users. Add LS News to your list of favorite channels today by clicking this link: LS News. You can also subscribe to the LS News RSS feed here. 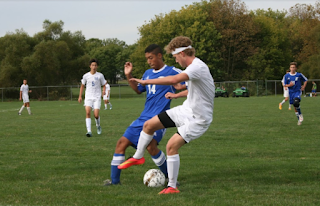 The Lampeter-Strasburg Boys’ Soccer Team sadly fell to Elizabethtown in the last 10 minutes of an exciting game Saturday, September 26th. L-S played a strong game, getting off a first shot by Nate Patterson (#9) at the 12 minute mark. Three other shots followed in the first half. Adam Lichty (#3) had two shots. His first shot was made at the 20 minute mark, and his second in the final 2 minutes of the first half. Matt O’Neil (#5) made the fourth shot of the first half at the 35 minute mark. L-S began the second half with the same steady skill with which they played the first. 15 minutes into the second half, Nate Erb (#10) headed the ball off of a corner kick towards the goal, only to have the E-Town goalie catch the ball. The second half progressed with a steady struggle between the two teams. After E-town scored three times within the final 10 minutes, Alex Knarr (#11) took the final L-S shot in the game within the last 2 minutes. The final score of the game was 3-0. Logan runs like a cheetah Mrs. AG yells at everyone This invasion of nature by humanity Things are thrown Tensions rise with the humidity The sun is bright We stop to write Our time outside is over We flee inside to our natural habitat Like a turtle, unevolved for centuries Our nature walk is over Our only nature walk, ever. For more LS Enigma and other Weekend Edition content. The trees blow in the wind Oxygen is released recycled to the world, True power lies there, like a garbage truck, Walking how weights do Consequences hit us, Walking we cannot. A few thousand people descended on Quarryville this evening expecting to see a football game. It was a rematch of two teams who, last year, went down to the wire with L-S ultimately emerging on top in the final seconds. Tonight should have been a chance for Solanco to redeem themselves, and L-S to retain its triumph. Instead, even calling it a "football game" is charitable; simply put, the actions of some marred any chance at sportsmanship. To quickly summarize the game, Solanco rushed its way to a victory -- on the field at least -- and won 42-14. For L-S, Bear Shank joined the 6000-yard club in the second quarter, and thus became one of just seven players to do so in Lancaster-Lebanon League history. On September 24, the new L-S girls’ tennis coach dealt with a tough choice: choosing either his family or his team. The number one player for the opposing team is Coach Josh’s sister, and by knowing her tennis talent, the match seemed more nerve racking than most. The greased pig contest was, once again, a huge success. This is unquestionably the most viewed event at the fair; not only were the bleachers constantly packed, but the wooden fence was topped with spectators of all ages. The pig chasers ranged from age 5 to high school, although the age groups become smaller as the night wore on. Particularly favored by the crowd was the age 5 girls’ class, which exemplified that wearing pink does not make you weak. Congratulations to all of the 2015 greased pig contest winners! 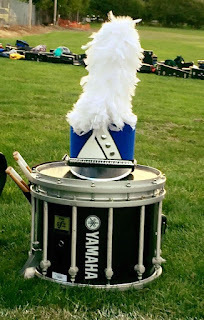 Earlier in the evening, the Lampeter-Strasburg Pioneer Marching Band performed its field show "Setting Sail", as well as a selection of stand music tunes while director Mr. Larry Royer shamelessly promoted the band burgers available for purchase. With day two in the books, just one more day of cows and community remains. Check out the Picasa Album of this evening's festivities, featuring photos from Ashley Crutcher and Alyssa Van Lenten. Tastefully styled from head to toe (and often in a deep, reddish shade of burgundy), this trendy newcomer has recently hit the halls of L-S High School. She hails from the Scandinavian province of Norway and is our third and penultimate featured foreign exchange student for the 2015-2016 school year. Mette Smaland is her name, the first pronounced like the beginning of the word “metaphor,” but with a sharper “t” sound in the middle. To Smaland, the country of America always been intriguing. In her younger years, she vacationed in Florida, and has since dreamed of returning to the U.S. However, this time around, she finds herself surrounded by the bucolic pastures of Lancaster County rather than the humid subtropics of The Sunshine State. LSNews.org had a team of photographers at the Fair Queen contest, and took dozens of photos as well as several videos of candidates' opening speeches and responses to the questions. A few of these images and videos are available in the original article; the rest are in links below. As finalists came forth to share what they would improve about the West Lampeter Fair, most said something about broadening its scope or trying to engage a greater audience. Chelsea Hancock declared that the parking situation was "nerve wracking". And a few minutes later -- minutes that were probably nerve-wracking for those contestants involved -- Hancock, who represented the Ski and Snowboard Club as its first ever nominee, was named the 2015 West Lampeter Fair Queen. "I'm a little teary," she says just after the result was announced. "It feels amazing. I can't wait to embark on this journey." The journey of the evening began over three hours before its conclusion, when candidates assembled in the faculty parking lot to form for the parade to the fairgrounds. Much to the delight of Mrs. Tina Shockey, Fair Queen coordinator, all 11 candidates arrived on time, the first that has happened in her five years. On Wednesday September 23, the Fellowship of Christian Students (FCS) arose early to stand out in the cold morning weather to worship and pray for the annual event of See You At The Pole. It is an annual event of the club to gather in the grass by the flag that stands at the entrance to the high school main office to worship and pray about anything and everything. Whether it be as big as the world or as personal as the school, the students brave the elements and possible judgement from their peers to pray, no matter the circumstances.